It’s the cry of every parent suffering from cabin fever: Go outside and play! But that’s not only good advice for kiddos–it’s great advice for all of us. Don’t let the cold temperatures deter you. We Mainers live in a winter wonderland, so here are our suggestions for outdoor winter activities to enjoy now. There’s no denying the cardiovascular beneft of cross country skiing. The average person burns between 400-500 calories per hour doing the sport. Aside from the cardio benefit, getting out on skis allows you to enjoy the beauty and serenity of nature in winter. Many of Three Rivers Land Trust’s properties are great venues for cross country skiing. Try Hobbs Farm (651 Foxes Ridge Rd., Acton). Also try the Sanford Trails system of trails. I particulary like starting at the small parking area on Hanson Ridge Road (near Sevigny’s blueberry farm) and skiing towards town. Harris Farm in Dayton, Maine is a popular destination for cross country skiers. It’s family friendly and offers ski rentals. Some folks (that would be me) aren’t comfortable with the idea of careening down a slick mountain at great speed on two thin pieces of fiberglass or kevlar. However, I have met many (mostly sane) folks who enjoy this sport. If you’re a downhill skiier you have many ski hills available to you in southern Maine and nearby New Hampshire. King Pine is relatively close by in Madison, NH and offers relatively tame hills. It’s family friendly and offers ski equiptment rentals. If you haven’t been ice skating since you were a kid then it’s time to give it another try. 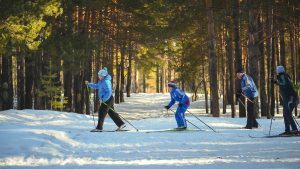 Yes, you’ll be wobbly your first time out, but, much like cross country skiing, it’s a great way to get exercise. Looking for a local place to ice skate? Try Number One Pond in Sanford or Shapleigh Pond in North Shapleigh. If the cardio workout from cross country skiing isn’t enough for you, then try snowshoeing which burns up to 1,000 calories per hour. This outdoor winter activity will also allow you to enjoy nature’s seasonal beauty at a pace that’s comfortable for you. There are many local places to snowshoe. You may like the Williams Town Park in Shapleigh for a moderately challenging hill climb. Looking for a shorter and sweeter trail? Try the George Sweet Trail off of Great Works Drive in South Sanford. Mousam Way Trail in Sanford is also fun. Outdoor winter activities aren’t only for kids, they’re also for the young at heart. Build a snowman, make a snow angel, or pick a snow ball fight. I’d be remiss if I didn’t mention the greatest fringe benefit of all outdoor winter activities: hot coco (with marshmallows, of course) when you’re done. Enjoy! What are your favorite outdoor winter activities? Share them on our Facebook page.